Stephanie Schofield in Food on 8 February, 2016. 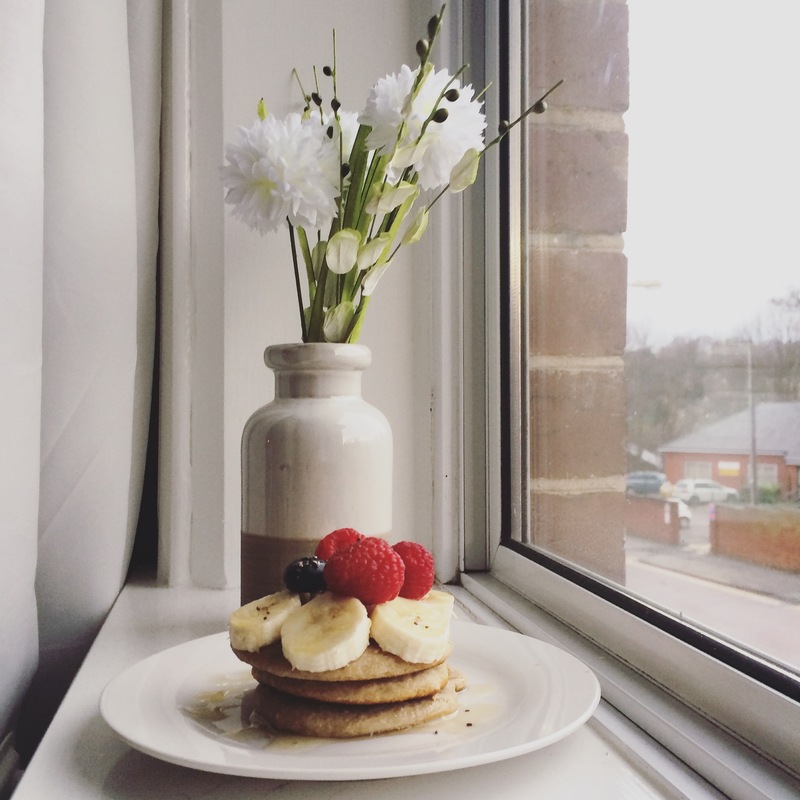 Homemade pancakes topped with banana, fresh berries & maple syrup! Combine the flour and salt in a mixing bowl. Crack in the eggs along with 50ml of the milk and oil. Beat the mixture until you have a smooth, thick paste. Bit by bit, add in the remaining 250ml of milk, whisking in between until the batter has a consistency of slightly thick single cream. Ladle some of the batter into a hot and lightly oiled pan, tilting the pan to get a thin and even layer. If the pan is the right temperature, the pancake should turn golden underneath after approx. 30 seconds and will be ready to turn (or flip if you’re brave!). Sift together the flour, baking powder, salt and sugar into a large bowl. In a separate bowl, lightly whisk together the milk and egg. Melt the butter and allow to cool before whisking into the milk and egg mixture (we don’t want scrambled eggs…). Beat the milk mixture into the flour mixture using a fork until it forms a smooth batter and let this stand for a few minutes. Add a ladle of the batter into a hot and buttered frying pan over a medium heat. Wait until the top of the pancake begins to bubble and using a spatula, carefully turn it on the other side and cook until the pancake has risen to approx. 1cm thick. Additions to mix: bananas, blueberries, chocolate pieces and/or cinnamon! Perfect when topped with honey or golden syrup! In a blender, combine all the ingredients and blend until the mixture is well incorporated and as smooth as you want. Allow the batter to stand for 10–20 minutes until it has thickened slightly. Add a tablespoon of the batter (for each pancake) to a hot frying pan and fry until golden brown on both sides. Sieve the flour and baking powder onto the cooled mash. In a separate bowl, whisk together the eggs and milk and then add them to the potato mix. Fry 1 tablespoon of the batter (per pancake) in a hot oiled frying pan over a medium heat. Flip once the underside is golden brown and small bubbles appear. A classic that needs no explanation. Add butter for a richer result! Spread one-half of your pancake with Nutella, the other half with peanut butter and scatter with slices of banana. Fold both sides together and enjoy! And add in the Nutella if you want! Slice up a combination of your favourite fruit i.e. strawberries, blueberries and bananas or even try tropical fruits such as mango, passion fruit and pineapple. 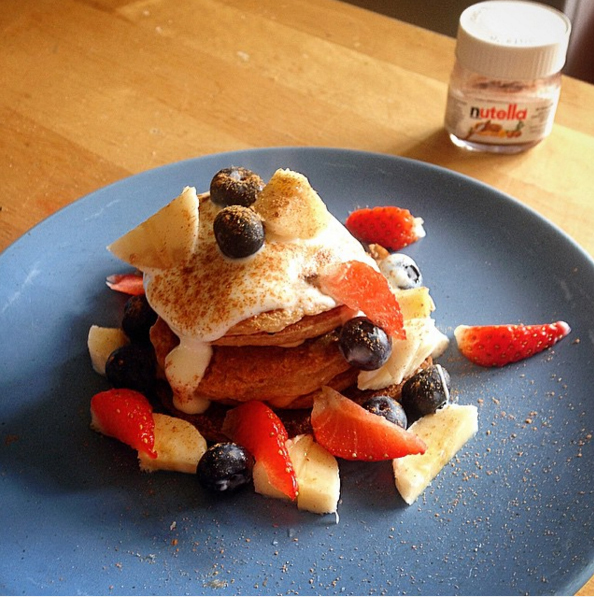 Serve the fruit scattered over the pancakes with a dollop of natural (or flavoured) yoghurt and a drizzle of honey. Melt the butter in a frying pan and stir in and combine the brown sugar, cinnamon, and salt. Add the apple to the pan, stirring to coat. Served with a pot of honey for added sweetness! Add all the ingredients into a medium saucepan. Stir and simmer gently over a low heat for 15 minutes until warm and syrupy ( if it appears too thick simply add 1 tablespoon of water). Gently fry the onion in oil until golden and caramelised, and add the spinach leaves to the pan for approx. 30 seconds (or until wilted). Add them to your pancakes and top with grated Gruyère cheese and a pinch of freshly ground black pepper. Fry up the bacon in oil until crisp (this often takes approx. 2 to 3 minutes). Halve, de-stone and scoop out the insides of the avocado into a bowl. Season the avocado with salt, pepper and lemon juice and smash with a fork until it reaches your desired consistency. Add this to the pancakes with the sour cream and bacon. Top with chilli to add a fiery kick. Cook the asparagus in a buttered pan for approx. 3–4 minutes on medium heat. Beat the eggs and tip into a buttered saucepan over a low heat and stir slowly and continuously with a wooden spoon for a couple of minutes (they are done when they are still slightly runny). Serve your pancakes with the eggs, cooked asparagus and some slices of smoked salmon and season with black pepper. An American classic and again, pretty self-explanatory! Also serve with a scoop of your favourite ice cream! In a saucepan combine the balsamic vinegar and sugar and bring to a boil. Simmer over a medium heat for 2 minutes, stirring occasionally. In a medium bowl, toss the sliced strawberries with the basil and add in the balsamic syrup. 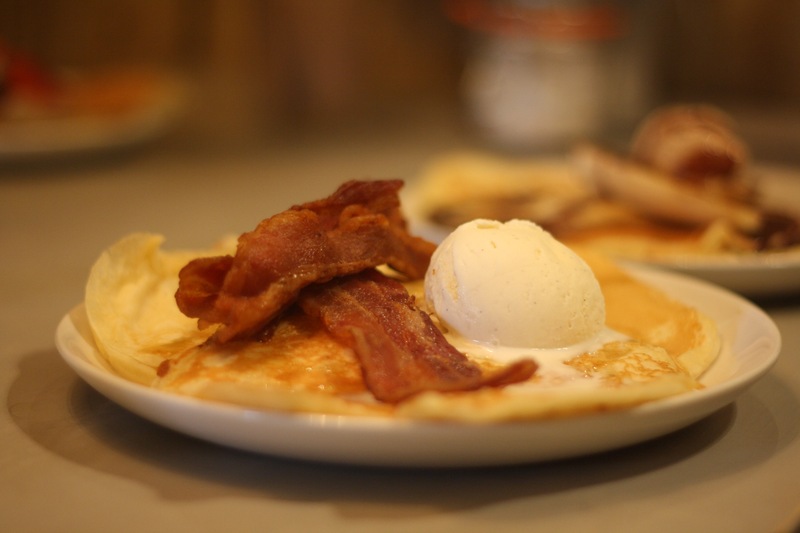 Flat White Kitchen offers a range of fluffy American style pancakes made with buttermilk, ricotta or mascarpone. Café Continental offers an impressive selection of seriously stuffed crêpes, just look at the picture below! 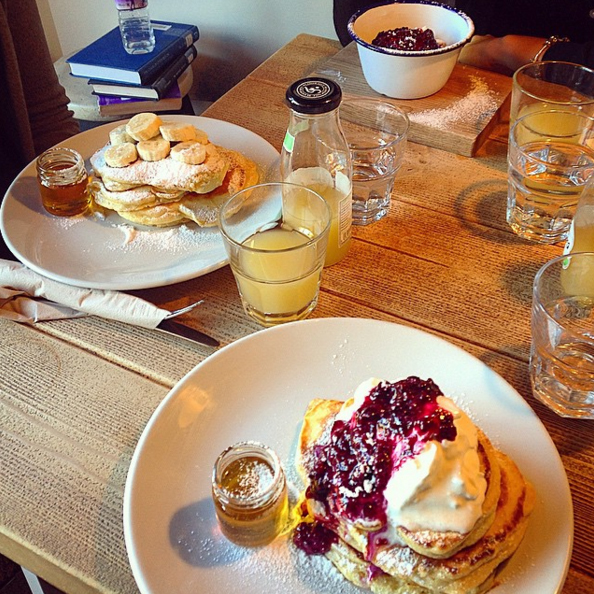 The Pancake Café (Georgian Townhouse) is a student favourite (it’s all in the name….). 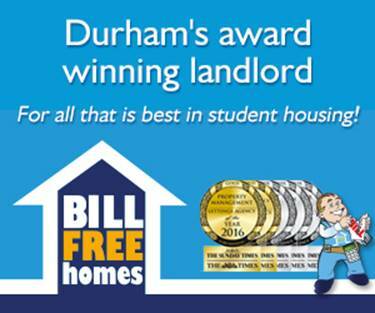 Be sure to go early as they don’t take bookings and are usually jam-packed on Pancake Day. Waffley Good Company is a wonderful alternative for those of you who are too ‘edgy’ to eat pancakes for Pancake Day. 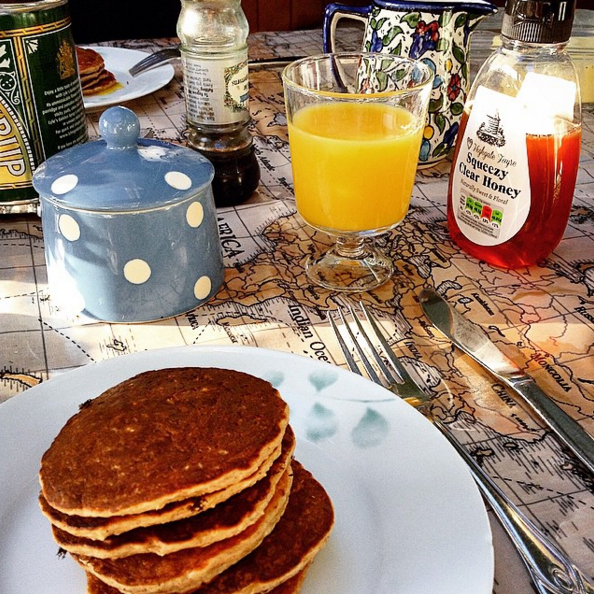 Have a flippin’ fabulous Pancake Day everyone!